The SKS Shock blade II Mountain Bike Fenders offers total protection via a durable dirt board that comes with two components and attaches securely to the suspension fork of your bicycle. It fits perfectly on bikes with twenty eight inches and twenty nine inches rim. This high quality fender offer an efficient guard against mud splash, water splash and loose dirts thereby keeping yourself and your bike clean. It comes with a mount that utilizes a quick release mechanism for easy and quick attachment to your bike. A cone attachment utilizing a quick release mechanism and attaches seamlessly to the steering frame. Compatible with both casual and mountain bicycles that has twenty eight and twenty nine inches rim. 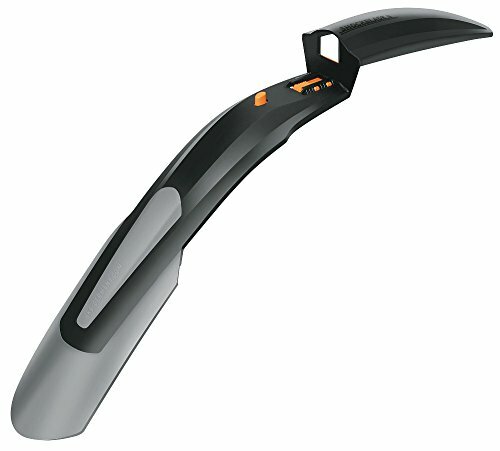 The SKS Shock blade II Mountain Bike Fender is a decent product that protects you and your bike from water and mud splashes together with protection from loose debris. It does not work well with wheels lesser than twenty eight inches in size and can be installed and detached with relative ease. It works well also with MTB that comes with front suspension. Ensure you tighten the screws adequately in order to expand the cone for proper fitting to the steering frame but exercise utmost care as well because the cone is made from plastic and can crack if the pressure is too much. One down side of this product is that it wobbles a bit on the attached mount but it’s not a big deal as you will get used to it. If you are tired of gettimg sprayed with dirts or splashes and you want your bike to maintain a clean look after each ride, then this is the product for you.